Nicola Bryant is scheduled to record a new interview tape for MythMakers / Reeltime Productions... this one in Lanzarote, site of the filming of her debut story, "Planet of Fire". Louise Jameson is to star in a new sitcom, 'Mirrorball', with 'Curse of Fatal Death's Julia Sawalha. The series features the team from Absolutely Fabulous. Bonnie Langford (Mel) and her husband Paul Grunert are expecting their first child; we recently wrote the happy couple, who confirmed they were expecting in October. Our best wishes to the proud parents-to-be. Tom Baker and Elisabeth Sladen made appearances at this year's London International Stamp Show at the Earl's Court Exhibition Centre, where they signed BBC-licenced First Day covers featuring the Post Office's Dalek stamp. Below are the three stamps we have graphics for (courtesy Gallifrey 5). Missing Pieces: A brand new for-charity Doctor Who anthology collection has been announced. Edited by Mark Phippen (creator & co-editor of "Perfect Timing") and Shaun Lyon (editor of Outpost Gallifrey), the book will feature stories, artwork and poems from fans and many Doctor Who professionals. Actors Colin Baker, Peter Davison and Wendy Padbury will be participating in the collection, which is being sold for both the Downs' Syndrome Association and the Foundation for the Study of Infant Death; Davison will contribute the foreword for the volume, while Baker and Padbury will actually pen Doctor Who short stories! Among the pro authors who have agreed to contribute (schedule permitting) are Kate Orman, Lance Parkin, Trevor Baxendale, Gary Russell, Paul Cornell, David McIntee, Paul Magrs, Keith Topping, Martin Day, Peter Anghelides, Jim Mortimore, Jonathan Morris, Mike Tucker, Craig Hinton, Dave Stone, Nick Walters, Daniel Blythe, Simon Bucher-Jones, Keith R.A. DeCandido, David J. Howe, Paul Leonard, Jonathan Blum, Andy Lane, Jon de Burgh Miller, Stephen Cole, Simon Gerard (BBV), Rob Shearman (Big Finish) and John Peel. The cover for the anthology is being done by fan artist Nathan Skreslet. For more information, visithttp://www.gallifreyone.com/pieces.htm. We're happy, by the way, that Missing Pieces was just mentioned in the pages of Doctor Who Magazine, issue 295. Thank you to the DWM staff for helping us promote this charitable venture! The New Jade Pagoda: The Jade Pagoda, one of the foremost Doctor Who discussion lists on the 'net devoted exclusively to the Doctor Who novels (Virgin and BBC), has moved to Egroups off the old Listbot service. Now, Jade Pagoda features the ability to read on the searchable website itself and much more. To join the new Jade Pagoda list, send an email to jade_pagoda-subscribe@egroups.com. ESIN Closes Up Shop: We're sad to report that Kevin Parker has published the final issue of "The South Croydon LISTener," the official newsletter of the Elisabeth Sladen Information Network. The ESIN will continue as a web-only group found on Egroups. Walking Through Eternity: Author Jay Eales (co-editor of Perfect Timing 2) is putting together a new anthology. Says Eales: "It's a collection of Doctor Who stories with a difference. Fans of deeply traditional (and oh, so familiar) corridor runarounds are probably going to be disappointed with the mix of stories here. It will focus very much on the experimental side, taking the motto "Originality over continuity." One of the new authors is Steve Gallagher, in his first Doctor Who piece since his script "Warriors' Gate" from Season 18 of the series. More information soon. Timelink: Now available from TSV Books (part of the New Zealand Doctor Who Fan Club) is a revised edition of "Timelink - An Exploration Of Doctor Who Continuity" by Jon Preddle. This unauthorised volume is 322 pages, A4-sized, and "covers various aspects of Doctor Who continuity, such as the controversial UNIT dates, Dalek and Cyberman history, the Doctor's age, and Gallifreyan history. The book uses as its study material only the broadcast television adventures from 1963 to 1989, plus K9 and Company and the 1996 TV movie." The new edition contains some updated material. For more info go to www.geocities.com/jpreddle/timelink.html or email jpreddle@ihug.co.nz. Tales from the Solar System: Another fan-published charity volume for the Foundation for the Study of Infant Death, this book features stories by Paul Leonard, Martin Day, Lance Parkin, Jon De Burgh Miller and Paul Magrs. According to editor Paul Griggs, the book has indeed started shipping, but because of the printers being used, they are only being shipped 50 at a time; hence, earlier orders will get earlier priority. More information is available at their website at http://welcome.to/tales. The Making of Fury From the Deep" by Richard Bignell is currently available with the reconstruction of this classic story. The documentary contains all available color footage from the story (shot on small camera) as well as commentary by cast and crew Hugh David, Michael E. Briant, Margot Hayhoe, John Abineri and Roy Spencer, along with Peter Day (who worked on Visual Effects) and excerpts from "The Slide," author Victor Pemberton's 1966 radio play which was originally submitted to the DW production office in 1964 and which was eventually reworked into "Fury". The final duration of the documentary is 51 minutes and is circulated on telesnap reconstruction tapes with the story. BBV Returns to Video Production: BBV has returned to the video fold with "Cyberon". As noted on BBV's website: "We’ve made contact with something better than us. They are stronger, they don’t die. They’ll cast off their human bodies and spread to the stars, nothing will stop them." Doctor Lauren Anderson is understandably sceptical when research scientist Tom Mordley arrives to perform clinical trials of a new wonder drug. But not only does the drug work... it works miracles. It is only when the side effects begin to manifest themselves that Doctor Anderson must take matters into her own hands and find out the truth behind a drug called... CYBERON." Principal photography on this new production has been completed. The video stars Jo Castleton as Dr. Lauren Anderson and P.J. Ochlan ("Space: Above and Beyond - Toy Soldiers") as Tom Mordley, and is wrtitten by Lance Parkin. "Cyberon" is slated for an October release. I Scream - Written by Lance Parkin. An all new adventure featuring the "I" created by Kate Orman and Jon Blum for the novel "Seeing I." "It was never like this for Reggie Perrin. Is our heroine paranoid or are they really out to get her... and the galaxy as well. The fall and rise of an executive in the galaxy's biggest ice cream firm." Lisa Bowerman, star of Big Finish productions' other series of audios based on Benny Summerfield (the former Doctor Who novel companion character), and Jo Castleton, who has featured in both BF and BBV audios, star in this production. Now available! Sontarans: Conduct Unbecoming - Written by Gareth Preston. "The Sontarans... a race of formidable warriors cloned from the most formidable of their progenitors, General Sontar. But now something threatens to destroy them all, an insidious threat that strikes at the very heart of their being..." Featuring Tom Chadbon from "City of Death" and "The Mysterious Planet." Now available! Race Memory - Written by Paul Ebbs. An all new adventure featuring the alien Wirrn from Doctor Who. Double CD release. Due in September 2000. Resurrection of the Rani - Written by Pip & Jane Baker (the authors who originally created the character). Enslaved by her former servants, the Rani is forced to use her formidable scientific knowledge to satisfy the Tetraps thirst... for blood. Kate O'Mara has agreed to return to the role and BBV is currently negotiating with her agent for schedule dates. Due in October 2000. Faction Paradox Returns? One of the most controversial (and popular) concepts in the Eighth Doctor BBC novels may see new life, through BBV. We're told that Lawrence Miles, who created Faction Paradox, is currently negotiating to write a new audio (one or more) concerning the Faction. Video on the Web: BBV has put several video clips on the web. Says the BBV press release: "With the imminent release of the latest Audio Adventure in Time and Space, the latest Sontaran epic, Conduct Unbecoming, BBV Online presents "For Battle and Glory" an exclusive download in VQF format featuring writer Gareth Preston and actors John Wadmore and Anthony Keetch. Also now available is BBV Online's first ever video download (in RealMedia format) with a look back to the recording of Ghosts, a Season 2 adventure featuring Sylvester McCoy and Sophie Aldred as The Dominie and Alice." Doctor Who Video in North America Goes to Warner Home Video: Doctor Who video distribution in North America has been taken over by Warner Home Video. CBS/FOX lost its contract with BBC Worldwide Americas on July 31. Subsequently, all videos were requested to be pulled by vendors across North America; major chains such as Suncoast, Virgin, etc. were given 3 weeks to remove them from their shelves and return them The new versions of BBC titles here in the U.S. are being repackaged, though the features and transfers are all expected to stay the same. In addition to straight distribution chores, Warner will also handle marketing and sales duties for the BBC titles, though the length of the agreement has not been released. "Suffice it to say," our contact responded, "there are no plans to allow our back catalog of Doctor Who (or of any other back catalog titles for that matter) to dry up, aside from a handful of titles that have sold poorly. The other 100+ Doctor Who titles will carry over, no matter what occurs." Currently, no DW videos are currently available from online retailers or major chains except "Invasion of Time" (see below), though some store owners have reported to various Internet reporters that a large shipment of new Warner Who titles were due by mid-August (these have not yet materialized). At least 7 titles were supposed to be in this shipment, but have not yet made it to stores. Cybermen Box Set: Now confirmed by BBC Video for November 2000 in the UK is the Cybermen Box Set (seen at right). The set will be a double-tape feature of "Attack of the Cybermen" starring Colin Baker (which includes a clip from "Saturday Superstore" of Colin Baker and Nicola Bryant cutting a cake) and the first three episodes of "The Tenth Planet" starring William Hartnell. In addition, the fourth episode of "Tenth Planet," which is still missing, is being reconstructed by Ralph Montagu of the Doctor Who Restoration Team. Steve Roberts of the Restoration Team made the announcement on the Team's website forum that the reconstruction of "The Tenth Planet" part four will be full-length; instead of including a CD with the package, the entire episode will be reconstructed with audio for release on the tape. Roberts noted that it was due to paper copies of the requests made by people on the discussion forum presented to the BBC that they were able to get this done. 2001 Rumors Fly: A few websites have begun to speculate and/or offer rumors about 2001 Doctor Who videos, naming several stories including "Delta and the Bannermen," "Four to Doomsday," "The Ambassadors of Death" and "The Gunfighters," as well as a special Patrick Troughton clips tape and a compilation of episodes from missing stories remastered in better format. Also, BBC Video is rumored to be working on a special "Master Set" featuring two stories as yet unreleased from the Pertwee era: "Colony in Space" and "The Time Monster" for the 2001 holidays. Stay tuned. The Five Doctors: "The Five Doctors: Special Edition" is now out on DVD. Sound engineers were converting the soundtrack to Surround Sound format 5.1 as of late June. The DVD contains no "extras", but the soundtrack will be isolated so that incidental music can be listened to independently of the dialogue, even though the music doesn't necessarily match the screen action. It should be noted, however, that this release is for "region 2 & 4" (UK and Australia/NZ only) and will NOT be released at this time for North American DVD players. Remembrance of the Daleks: Due in January 2001. The copyright holders have refused permission to clear two pieces of music by 'The Beatles' used in episodes one and three; these will be replaced by either clearable soundalikes or BBC copyright Beatles performances if they are clearable. Around thirteen deleted or extended scenes from the '71s have been compiled onto an 'extras' tape, which will be augmented by a series of bloopers and outtakes from the recording sessions. Says Roberts: "Sadly, not all the original studio and location recordings exist in a broadcast format. However, the current owner of the timecoded VHS copies that were used during production has kindly loaned them to us, so we effectively have access to just about all the surviving recorded material." Two original BBC1 trails for the first two parts of the story have been located and will be included. In addition, two multi-angle sequences have been constructed, featuring Ace's baseball attack on a Dalek and subsequent escape through from the science lab window, and the impressive gate explosion sequence. Sylvester McCoy and Sophie Aldred recorded a commentary, and an extensive photo gallery will likely be included. Future Releases: The Restoration Team's spokesman Steve Roberts recently commented that BBC Video wants to run the gamut through all seven TV Doctors for DVD releases first; the Fourth, Third and Seventh are represented with these three releases, with future releases likely to include a First Doctor, Second Doctor (though NOT "Tomb of the Cybermen" says Roberts) and Sixth Doctor release... as well as a Fifth Doctor release (apparently, "The Five Doctors" does NOT represent the Fifth Doctor era in the minds of BBC Video). DVD Miscellaneous: At the time, no word of NTSC (North American) release of any Doctor Who DVD's but we do know that BBC Worldwide is investigating DVD release plans for 2001. Earlier, news correspondent James Whittington recently spoke to Rob Cory of BBC Worldwide on the subject of DVD releases in the UK. "We hope to roll out at least another 4 titles by Christmas 2001," Cory said, who indicated that the full-length version of the 1996 Doctor Who movie is among those currently under discussion. Cory said that BBC Worldwide hopes to be in a position within the next two years to release Doctor Who simultaneously on DVD and VHS video. Cory briefly mentioned the upcoming second DVD release, "The Robots of Death" (see below for more info on this story): "It's one of the most popular stories. We had lots of requests from fans for that one in particular. I'm sure all Doctor Who fans will appreciate the effort the effort that has gone into its production." The disc will have graphical elements like the ones used on the Five Doctors DVD as well as additional materials as reported here on the News Page. As far as the future, Cory said "We will try to have as many interviews recorded with original cast and production team as possible. We are always on the lookout for extra material associated with a story." UK - "The Edge of Destruction" and "The Original Pilot" video is in release; the pilot includes "the VT countdown clock, all the retakes, and even the bits between scenes when the VT's are running-up to record and you hear people asking for quiet on the set etc" says Steve Roberts. This is followed by "Time-Flight" in July and a new remastered version of "An Unearthly Child," the first Doctor Who story, forthcoming in September. The earlier announced restored version of "The Talons of Weng-Chiang" is no longer on the 2000 schedule. "The Daleks," which was scheduled to be released in late 2000, has now been confirmed for UK release in January 2001; this is the re-release of this video, remastered and repackaged. Australia/New Zealand - "The Talons of Weng-Chiang" will be released in October. Season 12: The Scripts Book: BBC Books will be publishing "Season 12: The Scripts"; Justin Richards is contributing editor, Barnaby Harsent is co-editor and Andrew Pixley is the book consultant. Contrary to rumors, this book has no dependance on the UK BBC2 repeats, now canceled. According to Richards, the book will be "heavily illustrated in both black and white and colour. There will be complete camera scripts (not the camera instructions though) for each of the season 12 stories, plus 'front matter' consisting of a review, background production notes, transmission, cast & crew details, etc. Each script will be heavily annotated to show deletions, additions and specific production details". The book was to be published in November 2000, but has been delayed due to clearance delays and other, more recent, publishing delays. According to Justin Richards, the book will likely see print sometime later in 2001. I, Who 2 On Horizon: After the success of the first volume, author Lars Pearson has announced "I, Who 2," the sequel to the original "I, Who: The Unauthorized Guide to Doctor Who Novels". The reference work is expected sometime in 2001 and will include books published after the ones in the first volume, as well as additional adventures (such as "The Masters of Luxor," the unfilmed Hartnell story) and possibly even delve into the realm of DW comic adventures. Howe's Transcendental Toybox - The Unofficial Guide to Who Merchandise: Co-authors David J. Howe and Arnold T. Blumberg are preparing this "complete collector's guide to everything that has ever been produced to tie in with the series. From hardback books, trading cards and chocolate Christmas tree decorations, to stained glass windows, underpants and metal models, this book is a fascinating and enthralling look at the world wide history, development and collectability of Doctor Who merchandise. This is the first and only reference and price guide to the entire history of Doctor Who memorabilia from 1963 to 1999. It will catalogue every kind of merchandise produced in that period, provide photos for many of the items listed, and discuss many aspects of the show's long history in light of the vast amount of collectible material produced about it. The book will document the history of the world's longest-running science fiction television show from the perspective of the marketing and merchandising juggernaut that the series spawned. Anyone who is a Doctor Who fan, science fiction enthusiast, armchair television historian, or collector of pop culture memorabilia will be fascinated by this book and the story it has to tell." The book will also feature articles on collecting, dealers, retailers and a variety of other directories. The book will be published in Fall 2000 as a limited edition volume by the authors, and will be available through them or via Firebird Distributing. For more info, visit the website athttp://homepages.which.net/~howe/merch.htm or http://www.atbpublishing.com. Pocket Essentials: Doctor Who: Author Mark Campbell has penned a new unofficial reference work, "Doctor Who," a Pocket Essentials guide from the same publisher. Says the press release: "As well as an introductory essay, each Doctor's era is put under the microscope with facts and informed opinion on all their stories. There's an in-depth reference section detailing further reading, fascinating and bizarre Doctor Who websites, and a short history of spin-off stories and merchandising." Pocket Essentials is said to be "a new series for the MTV generation brought up in the three-minute culture." The book was released in the UK in June 2000. For more information visit the website atwww.pocketessentials.co.uk. Author David McIntee will indeed return in August 2001 with "Bullet Time", a Seventh Doctor story that takes place prior to the TV movie, and features the character Sarah Jane Smith (actually, says McIntee, the book is more a Sarah novel with the Doctor rather than the reverse). Martin Day pens the February 2001 Past Doctor adventure "Bunker Soldiers". It's a First Doctor, Steven & Dodo pseudo-historical adventure. Day has confirmed that the book has been moved to the February slot, replacing "Psience Fiction" which was delayed until later in the year. Kate Orman returns to the Doctor Who fold with June 2001's The Year of Intelligent Tigers, an Eighth Doctor book. Meanwhile, Trevor Baxendale, as previously reported, pens Eater of Wasps, an Eighth Doctor book set for May 2001. Novelist Nick Walters will write his third Doctor Who novel for BBC Books, Superior Beings (formerly "The Gardens of Rocosia"), a Fifth Doctor & Peri novel tentative for summer 2001. The book "introduces a new race of aliens, the vulpine Valethske, and is set on the "garden planet" of Verde Alturas" according to Walters, who told Outpost Gallifrey: "The novel features some human characters - the story has changed a great deal from the initial synopsis. The main stars are, however, the Valethske - a race of vulpine, bipedal aliens on a quest to track down an ancient enemy of legend." "Rags" is a new Third Doctor/Jo Grant/UNIT novel by Mick Lewis, the author of the horror novel "The Bloody Man"; this is his first Doctor Who commission. "Rags" will be released in April 2001. Gary Russell returns in May 2001 for "Instruments of Darkness", the 'third and final' part of the loose 'trilogy' of his books from the Sixth Doctor era (including "The Scales of Injustice" and "Business Unusual"), featuring Melanie and a special guest appearance by Evelyn Smythe, the new companion character created for the Big Finish Doctor Who audio line. Terrance Dicks pens the November 2000 Eighth Doctor book, entitled "Endgame". Author Andy Lane makes his long-awaited return to the Doctor Who fold, co-authoring "The Banquo Legacy," the June 2000 Eighth Doctor book. Richards told Outpost Gallifrey that the book is "set on Earth, but not part of the so-called Earth arc thingy". Newcomer Steve Emmerson pens "Casualties of War," set in England shortly after World War I, while Paul Leonard also returns with"The Turing Test," set shortly after the second war with guest appearances by Alan Turing and Joseph Heller. Chris Boucher is penning a third novel for the range, "Psience Fiction," featuring the Fourth Doctor and Leela (who else?). Previously confirmed for early 2001, it is now confirmed that the book has been delayed until September 2001. Peter Darvill-Evans, former publisher and editor of Virgin Publishing's "Doctor Who: The New Adventures" and "The New Adventures of Benny Summerfield" series, is penning Independence Day. This past Doctor novel features the Seventh Doctor and Ace, and is due in November 2000. Keith Topping (co-author of "Devil Goblins of Neptune" and "The Hollow Men" for BBC books) has been commissioned for his first solo novel, a Fifth Doctor/Tegan/ Turlough/UNIT adventure called "The King of Terror," set in Los Angeles and due out in November 2000. Doctor Who Film: Though many rumors have suggested to the contrary, there is currently NO action on a Doctor Who movie by the BBC... except for wishful thinking and investigation into possible co-financiers. See the archive page for full details. Doctor Who Returns to the Radio: Doctor Who Magazine and several British newspapers recently reported that BBC Radio was in the advanced planning stages of a new Doctor Who project for Radio 4, for debut in early 2001. Sylvester McCoy and Sophie Aldred were touted as being considered to reprise their roles as the Seventh Doctor and Ace for the serial. An article in The Guardian, a UK newspaper, on March 27, indicated that the script is written by Dan Freedman and Colin Meake of Radio 4's Loose Ends comedy show. Freedman told Doctor Who Magazine that "This will not be a comedy. I'm keen to develop a new take, to bring forward darker aspects of the character." The Guardian story goes on to mention that Sylvester McCoy is considering the role, but that a BBC spokesman would not promise a series, being quoted as saying "We don't want to build up fans' hopes." Recent information suggests that the radio drama bears the provisional title "Doctor Who: Death Comes to Time". Actor Stephen Fry has apparently signed on to play a role in the production. At the Battlefield IV convention in late April, Sylvester McCoy commented that the Radio 4 chief who commissioned the production has recently been replaced and this could affect the show, which is currently slated to be taped in October 2000 and aired in February 2001. In early June, in the popular UK movie magazine Empire, Stephen Fry answered questions sent in by readers; he confirmed his involvement in a Doctor Who project for radio. "It is true. It's extraordinarily clever of him to know that. I've been sworn to the utmost secrecy by the BBC because there is such a huge contingency of Whovians, I think they call them. So it is true, but I can't tell you what part I play or what happens in it because I would be assassinated if I did." However, on June 7, Outpost Gallifrey was contacted by Dan Freedman, who sent us the following clarification: "The facts are: At least one episode is definitely being made, series is likely but not officially definite. Sylvester, Sophie and Stephen Fry are confirmed in it. Its called Dr Who: Death Comes to Time and is set after Survival. I write comedy when I'm writing, but I'm just producing this, not writing. Colin Meek (SF writer, not comedy) is writing it. Next week we should have an info page about how fans can be involved in it on the Online page. The departure of James Boyle (ex controller of Radio 4) doesn't mean anything bad, it took me 5 months to persuade him to have it..."
The BBC's official Doctor Who website has confirmed that the BBC has commissioned a pilot episode only ("This means that they have asked and paid for the production of one episode for Radio 4. If they like it, they will commission a series. Until then, there is no date for anything to be broadcast. At the moment, recording is scheduled for October.") Sylvester McCoy, Sophie Aldred, Leonard Fenton (Dr. Legge in "Eastenders") and Stephen Fry are confirmed by the site. A new and advanced completion date has been given for the pilot. Also, it looks almost certain that the pilot will be released on BBC Audio, eventually. Meanwhile, the BBC Symphony Orchestra won't be doing the pilot because of the new date, but they will be doing the series, if and when it happens, according to the BBC's official site; neither will David Bowie, who turned down a role in the new drama because of time concerns. However, John Sessions IS confirmed for the series if it happens. On Thursday June 29, BBC Online completed a live interview with Sylvester McCoy, Sophie Aldred, producer Dan Freedman and actor Kevin Eldon this week, all of whom are all taking part in "Death Comes to Time". The production will feature a new version of Ron Grainer's theme music. Eldon says he will not be playing the Master, but instead "a gay Cyberman triumphing in the homophobic world of evil robots" (he was, of course, joking). As of November 8, the pilot for this proposed series is complete. In addition to the above, actor Huw Thomas (coincidentally the brother of early Dalek director Richard Martin) is among the many cast members. If BBC Radio decides to go ahead with an audio series -- commissioning editors likley to make a decision in early January -- the series would likely not be out before June, according to our highly-placed sources. Doctor Who: Third Best of All Time! The British Film Institute recently compiled a list of the 100 greatest British TV series of all time... and Doctor Who came in at number three! Says the BFI: "The hilarious antics of hotelier Basil Fawlty have earned Fawlty Towers the title of greatest British TV show of all time. The British Film Institute called on top TV industry figures to draw up their list of the best 100 programmes of all time. Old classics like Doctor Who and Monty Python's Flying Circus scored highly, but shows from the 90s struggled to make an impression. Popular comedy Absolutely Fabulous came in at a measly number 17 and the addictive Who Wants To Be A Millionaire at an even less-impressive 23." Fawlty Towers ranked at #1, Cathy Come Home at #2; the rest of the top ten, starting from #4, are The Naked Civil Servant, Monty Python's Flying Circus, Blue Peter, Boys from the Blackstuff, Parkinson, Yes Minister/Yes Prime Minister and Brideshead Revisited. PC Pro DVD: This months issue of "PC Pro" magazine comes with a free DVD on the cover, promoting the BBC's DVD range. 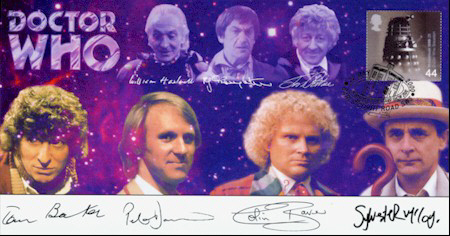 Included on the disc is a clip of the 5 Doctors Special Edition, which was released last year. New Exhibition: A new Doctor Who exhibition has opened at the Shires Shopping Centre in Leicester, England, and will remain open throughout August. More details are available at www.theshires.co.uk. Generation Game: The current series of Jim Davidson's Generation Game in the UK will feature a Dr Who item. Recorded 21/07/00 Colin Baker appears in costume along with the Police Box, Tardis Console, Cyberman and Dalek props. The two teams are asked to guess how much each prop is worth (with surprising results!). The show will air sometime in the new BBC ONE autumn season. At Gallifrey 2000, Big Finish announced that they have secured the rights to the character of Benny Summerfield to publish new original novels featuring the character. Paul Cornell, who owns the rights to the character, advised on an anthology that kicks off the new publishing foray; all books and audios will now have the moniker "Professor Bernice Summerfield And..." before the name of each production. They will not be called New Adventures, however, as BF only has the rights to certain individual characters and not many of the other creations in the earlier Virgin book range. Says the new website: "And so, we now prepare to pick up the story of her life, and those around her, some time later- at the dawn of the twenty-seventh century in fact. Benny has now set up home on The Braxiatel Collection, a small planetoid that her old chum and fellow academic Irving Braxiatel has created to house what is, probably, the biggest and best collection of... well things that people with money collect, in the galaxy. Scholars, researchers and interested parties the cosmos over flock to The Braxiatel Collection to see the art, literature, history and science on display there. Or they will, when Irving gets around to actually finishing it." Meanwhile, a new series of Benny audio plays will be issued bi-monthly, alternating with the novels. These new stories will not be adaptations from Virgin Books. Paul Cornell may be editing a second anthology in 2001, with an open submissions policy. Dragons' Wrath: Written by Justin Richards, directed by Ed Salt. Finally scheduled for September 2000; the original cover design will be changed to mesh with the new design for the relaunched audios "Dragons' Wrath" has been plagued by post-production difficulties with the studio. Says Big Finish: "This play, the last of the Benny Summerfield New adventures audio adaptations of Virgin novels (next year we begin wholly originsal udio exploits of Benny) was recorded last November and Big Finish received the dilogue/sound effects DAT masters during late March. Dissatisfied with the quality of the prouction, we decided to start again. This week (April 25th) have we got back the original recordings, made last November, and so shortly post-production will begin anew. As yet, we aren't in a position to offer a new release date but it will be as soon as humanly possible. BFP apologises to everyone who is looking forward to the play, especially those who pre-ordered, but we felt that it was better to delay Dragons' Wrath by a couple of months than put out a sub-standard play that did neither Justin Richards' story, Jac Rayner's script or Benny's fans any service." Professor Bernice Summerfield and the Dead Men Diaries: Anthology, edited by Paul Cornell. Release date: September 2000. The stories include "A Question of Identity" by Caroline Symcox; "Steal from the World" by Kate Orman; "The Light that Never Dies" by Eddie Robson; "Heart of Glass" by Daniel O'Mahony; "The Monster and the Archaeologists" by Kathryn Sullivan; "Step Back in Time" by Matt Jones; "Christmas Spirit" by Cavan Scott and Mark Wright; "The Door Into Bedlam" by Dave Stone; "The Least Important Man" by Steven Moffat; and "Digging Up the Past" by Mark Michalowski, with Cornell linking the stories together with a narrative as Benny. "She's forced to do an autobiography," Cornell recently told SFX Magazine, "so she gets other people to do it for her. The cover's going to be in the style of those Indiana Jones books. I'm just incredibly pleased with it." The Doomsday Manuscript by Justin Richards (Novel): Release scheduled for November 2000. The Secret of Cassandra by David Bailey (Audio): Directed by Gary Russell. Release scheduled for December 2000. Featuring Lisa Bowerman as Bernice Summerfield, with Lennox Greaves, Sally Faulkner, Helen Goldwyn and Robert Curbishley. The Gods of the Underworld by Stephen Cole (Novel): Release scheduled for January 2001. The Extinction Event by Lance Parkin (Audio): Release scheduled for March 2001. The Stone's Lament by Mike Tucker (Audio): Directed by Ed Salt; stars Lisa Bowerman with Harry Myers and James Lailey. Release scheduled for June 2001. A Benny Video? Big Finish confirmed at Panopticon 2000 that next year may see a video featuring the character of Benny Summerfield, produced by Big Finish. Doctor Who Continues on Audio:Big Finish Productions is currently releasing monthly Doctor Who stories starring members of the series' original cast. The BBC has renewed Big Finish's current contract for an additional year, through 2002. David Arnold to Compose Music: Film composer David Arnold, whose numerous scores include the films "The World is Not Enough," "StarGate," "Independence Day," "Shaft," "Godzilla" and television scores for "Stargate SG-1," "The Visitor" and "Randall and Hopkirk (Deceased)," will be remixing the Doctor Who theme in an all-new arrangement (based on the Delia Derbyshire themes from the early days of the series) for the four 2001 Paul McGann Doctor Who stories from Big Finish. Arnold, who will also be composing the film score for the next James Bond film, is said to have gone back into the series' past to the Derbyshire recordings to give the McGann audios a new, haunting feel. CD Distribution: Big Finish has announced that a number of the CD copies of "The Apocalypse Element" are defective and, in some cases, missing altogether. "These problems occurred in the latter stages of production at the CD pressing plant. The company used for The Apocalypse Element is not the one normally used by Big Finish and consequently we will not be using them again. If you have received a defective Apocalypse Element, Big Finish apologize for the inconvenience and disappointment and would ask you to return the play as purchased (the case and all enclosed CDs) to: Big Finish, PO Box 1127, Maidenhead, Berkshire, SL6 3LW. A new, fully playable, Apocalypse Element will be sent back to you." Changes to Distribution: Says Big Finish, "The final three releases of this year, The Shadow of the Scourge, The Holy Terror and The Mutant Phase are all set to be issued towards the end of their respective release months, so please be patient. Sorry about this but production constraints and the availability of the leading actors have made this necessary." Gareth Thomas, who starred for two years as the title character in TV's "Blake's 7" (and returned twice in later seasons), guest stars in "Storm Warning" as Lord Tamworth. The Cybermen are back in the Doctor Who fold, returning for "Sword of Orion," the February 2001 audio play. "The Shadow of the Scourge" (October 2000): Written by Paul Cornell. Stars Sylvester McCoy, Sophie Aldred and Lisa Bowerman as the Doctor, Ace and Bernice Summerfield, the Seventh Doctor's next companion from the Virgin "New Adventures" series. "The Pinehill Crest Hotel in Kent is host to three very different events: a cross-stich convention, an experiment in time travel and... the summoning of the scourge. The Doctor, Bernice and Ace find themselves dealing with a dead body that's come back to life, a mystical symbol that possesses its host, and a threat from another universe that's ready for every trick the Doctor's got up his sleeve. This time, has the Doctor gone too far? This story takes place during the run of Virgin Publishing's New Adventures series of books, and is set between "All Consuming Fire" and "Blood Harvest"." Originally "The Summoning (of the Scourge)". Also stars Michael Piccarilli (James in the Australian soap "Home and Away"), Holly King, Nigel Fairs, Lennox Greaves, Caroline Burns-Cook and Peter Trapani. "The Holy Terror" (November 2000): Written by Rob Shearman. Stars Colin Baker as the Sixth Doctor and introducing Robert Jezek as Frobisher, the Whifferdill shapeshifting companion (yes, the penguin) from the pages of Doctor Who Magazine. Music by Russell Stone. "The TARDIS lands in a forbidding castle in a time of religious upheaval. The old god has been overthrown, and all heretics are to be slaughtered. Obviously it isn't the sort of thing which would happen there every day - just every few years or so. And when the Doctor and Frobisher are hailed as messengers from heaven, they quickly become vital to opposing factions in their struggle for power. But will they be merely the acolytes of the new order - or will they be made gods themselves? An evil destructive force is growing deep within the crypt. And the pair soon find out that they will be lucky to escape their new immortality with their lives." Also starring Dan Hogarth, Sam Kelly, Roberta Taylor, Helen Punt, Stefan Atkinson, Peter Sowerbutts, Bruce Mann and Peter Guinness. "The Mutant Phase" (December 2000): Written by Nicholas Briggs. Starring Peter Davison and Sarah Sutton as the Doctor and Nyssa. Third of the "Dalek Empire" stories featuring the Doctor. "Storm Warning" (January 2001): Written by Alan Barnes (editor of Doctor Who Magazine), directed by Gary Russell. Paul McGann returns to Doctor Who in the first of four stories as the Eighth Doctor; also introducing India Fisher as Charlotte "Charley" Pollard and guest starring Gareth Thomas ("Blake's 7") as Lord Tamworth. "After a dangerous encounter in the space/time vortex, the Doctor finds himself on Earth, October 1930. Or rather above it, aboard the British airship R101 on it's maiden voyage over France. Also on board is a young stowaway, Charlotte 'Charley' Pollard, seeking adventure and excitement away from her stifling family atmosphere. What Charley doesn¹t know but the Doctor does is that the flight is destined to end in tragedy, although no-one really knows why. Not even the Doctor, although maybe the passenger in Cabin 43 can help..." Also starring Nicholas Pegg (Frayling), Barnaby Edwards (Rathbone), Hylton Collins (Chief Steward Weeks), and Helen Goldwyn (Triskelion). Set around an airship disappearance in 1930. "The Sword of Orion" (February 2001): Written and directed by Nicholas Briggs. Stars Paul McGann and India Fisher as the Eighth Doctor and Charley. The Cybermen are back, hiding aboard an abandoned freighter in space, being sought by less than honest scrap merchants. But what is Captain Deeva Jansen's involvement and why does the Orion war suddenly seem so perilously close... Also starring Michelle Livingstone (Deeva), Bruce Montague (Grash), Helen Goldwyn (Chev), Ian Marr (Ike), Hylton Collins (Vol), Toby Longworth (Kelsey). "The Stones of Venice" (March 2001): Written by Paul Magrs, directed by Gary Russell. Stars Paul McGann and India Fisher as the Eighth Doctor and Charley, with guest star Michael Sheard as Count Orsino. The Doctor and Charley become embroiled in the decadent court of a tired Duke and his search for his beloved wife. The curse of the long since dead Duchess has finally come to pass and the enchanted city of Venice is sinking beneath the canals. Also starring Nick Scovell (Churchwell), Barnaby Edwards (Pietro), Elaine Ives-Cameron (Ms. Lavish), Mark Gatiss (Vincenzo). "Minuet in Hell" (April 2001): Written by Alan W. Lear and Gary Russell, directed by Nicholas Briggs. Stars Paul McGann and India Fisher as the Eighth Doctor and Charley, with special guest star Nicholas Courtney as Brigadier Lethbridge-Stewart. The twenty-first century has just begun, and the newly-formed state of Malebolgia is seceding from the rest of the United States of America. After his successful involvement with Scotland's devolution, Brigadier Alistair Gordon Lethbridge-Stewart has been invited over to Malebolgia to offer some expertise. However, there's someone held in a lunatic asylum who interests him, someone who believes he travels through space and time in the TARDIS. It is not, however, his old friend the Doctor... Also stars Robert Jezek (Brigham Elisha Dashwood), Helen Goldwyn (Becky Lee), Maureen Oakeley (Dr. Dale Pargeter) and Nicholas Briggs (Gideon Crane). "Bloodtide" (June 2001): Written by Jonathan Morris. Features the Sixth Doctor and Evelyn with the return of the Silurians from the television series, and... Charles Darwin! The story will delve into the reasons behind Evelyn's travels with the Doctor. Dalek Empire I [Title TBA] (June 2001): Stand-alone Dalek story without the Doctor, written by Nicholas Briggs. "Dark Rising" (July 2001): Written by Mike Tucker. Features the Seventh Doctor and Ace; no further details known. Untitled (August 2001): Written by Gareth Roberts and Clayton Hickman. Features the Sixth Doctor and Mel. Some other authors pitching stories for the latter third of 2001 include Steve Lyons (probably with another historical tale), Alan W Lear, and the writing team of Cavan Scott and Mark Wright.